Click on our Facebook Blog page to find out the day to day or month to month goings on at the Mill. Mail - 399 Old Spencer Mill Rd. 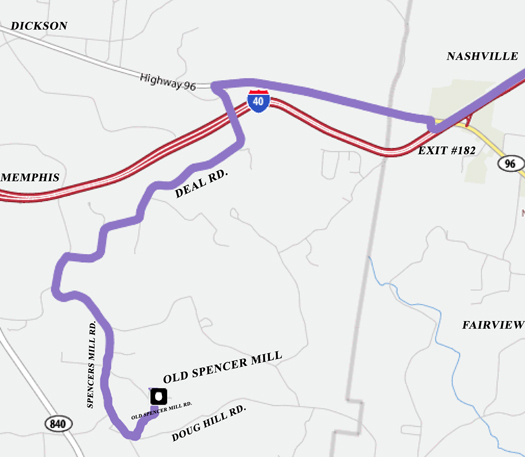 Take I 40 to EXIT #182 FAIRVIEW/DICKSON HWY 96. From Nashville Turn Left Towards Dickson or From Memphis Turn Right Towards Dickson. DO NOT turn on to Old Spencer Mill Rd. yet, as you will have to drive over Parker's Creek! Drive about 300 feet into Old Spencer Mill. Come on home to one of Tennessee's premier historic event sites. Nestled in the private hills of Burns, Tennessee, Old Spencer Mill is one of the only "1800's" type gristmill in Tennessee with 2 sets of French burr Stones & original equipment all actually powered by a 20' tall Fitz waterwheel, a General Store, Post office, a Tee Pee, Cabins, Creek side fun, peacocks and much more. Built in the early 1800's, old Spencer mill's historic site is the perfect private location for any event, company picnic or party. 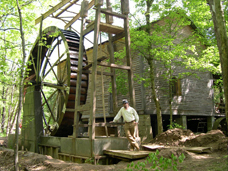 The Mill's Living History Tours are Just "ALIVE"
Visit the Historic Creek side 20 foot Water Wheel and Real Working 1800's Gristmill with a Dozen Pretty Peacocks! "Old Spencer Mill will host your wedding or event in elegant style with a romantically rustic atmosphere"